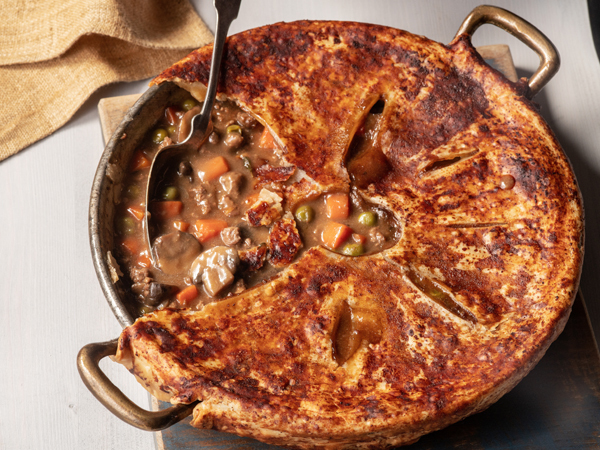 Dale’s Beef Pot Pie is great for family style dinners. This flavorful recipe has diced vegetables and Dale’s seasoning. Check out Dale’s Beef Stew if you're looking for a similar dish. Then, heat a large skillet over medium-high heat. Add the butter to melt, then the onion and carrot. Continue to cook 6-8 minutes, stirring occasionally, until the onion and carrot are slightly softened. Next add the ground beef and mushrooms and continue to cook for 5-6 minutes, or until the beef is no longer pink. Add the flour and cook 1 more minute. Add the soup, stock, 2 tablespoons Dale's, dried thyme and peas. Bring to simmer, then reduce heat to medium and cook for 5 minutes. Transfer pot pie to a 9" deep dish pie plate. Cover the pie plate entirely with the pie crust and tuck the remaining crust under the lip of the pie plate. Cut 5 slits in the top of the crust. Continue to brush all over with remaining tablespoon of Dale's. Next, bake 35-40 minutes, or until crust is golden. Finally, Let rest 5 minutes, then serve.